Let’s be honest, you’re slightly misled by the title of this. Kinda, sorta. I am about to tell you the absolute best time to post on Facebook. But really, that time depends on you. There is no golden hour for Facebook posts. There is no shining star that works for everyone. There is no miracle worker. Facebook is a pay to play system now. Back in “the day” you could go on Facebook, post something, and all of your page followers would see it. But now you’re lucky if you can get a handful of people to see your content… unless you pay Facebook for that to happen. I have some good news though. You can increase it from a handful to two handfuls, and maybe even more! There are two methods that can help you increase your reach by posting at better times. Two methods to determine the absolute best time to post on Facebook. The first method I like to call the Common Sense approach. Think about this for a moment. Let’s say you are a family photographer, or a newborn photographer or any photographer who’s target market is moms and dads. Parents who have busy lives between work and kids. What time do you think would make the most sense to post? If you said 1 PM then you’re way wrong. If you said 7 PM then you’re in the right ballpark. Here is why. Parents work until 4 or 5 PM, come home, make dinner and then put their kids to bed. 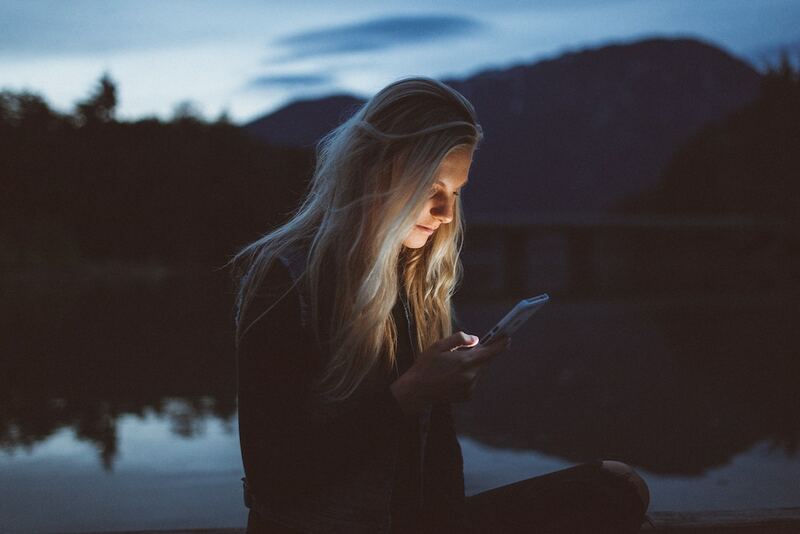 Parents are most often on the Internet, these days more commonly with their phones, between 7 and 9 PM. That is when parents are rocking their tiny babies, or just finished tucking in their kids. Maybe they’re having their quiet time, relaxing with a glass of wine, beer or unsweetened iced tea. Depending on the situation, quiet time might be even later, so you could say another popular time is between 9 PM and midnight. Going along with the common sense approach, another popular time could be between 7 and 9 AM before the kids wake up, eat breakfast and get ready for school. But does this mean all photographers should post on Facebook between 7 and 9 PM? No, because not all photographers care about parent scheduled. Before we move on to the next method, I have to point out that the time range, like 7 – 9 PM, is quite a large range. Two hours is no joke! So you could theoretically use the next method to fine tune that time to something even more accurate. 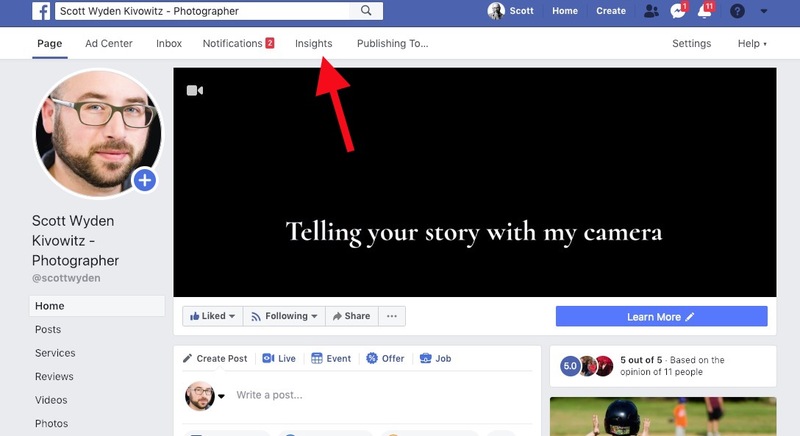 If you have a Facebook page for your photography business like you should, then you hopefully hooked up Facebook Insights for your website and are tracking all the things Facebook lets you track, and hopefully, your Facebook Pixel is working so you can remarket to your audience via ads. Facebook Insights has a really nice graph, which isn’t too easy to find. It shows you exactly when the people who Like your Facebook Page are online browsing Facebook. It shows you the days and the times. That means you can literally fine tune your posting schedule to match those times. Then, using a tool like Buffer, you can easily schedule all of your content to go out at those times. You can then test to see what times are working the best, and stick to it, or continue testing. I mean really, in business we are always testing things. 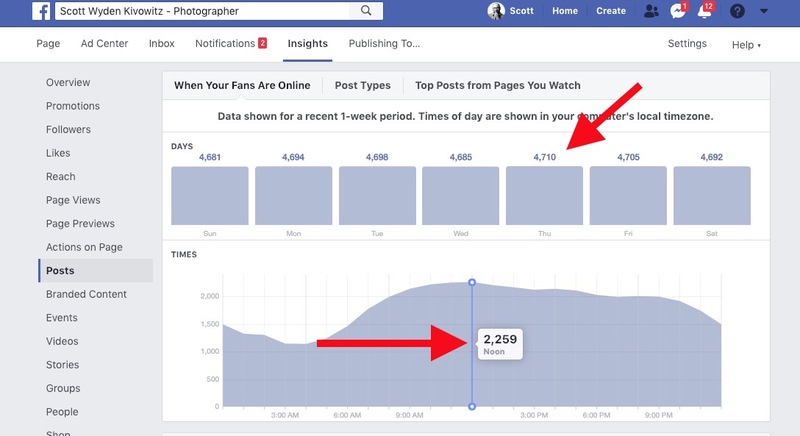 To get to the graph mentioned earlier, go to your Facebook page and click on Insights. Once there, click on the Posts tab on the left side. Then, at the top, you’ll see a tab called When Your Fans Are Online. Assuming you’re on that tab already, you can see what days are the most popular. In my case, you’ll see Thursdays are the most popular. I can then click on Thursday to see the Time graph adjust and show me the when most of my fans are online that day. 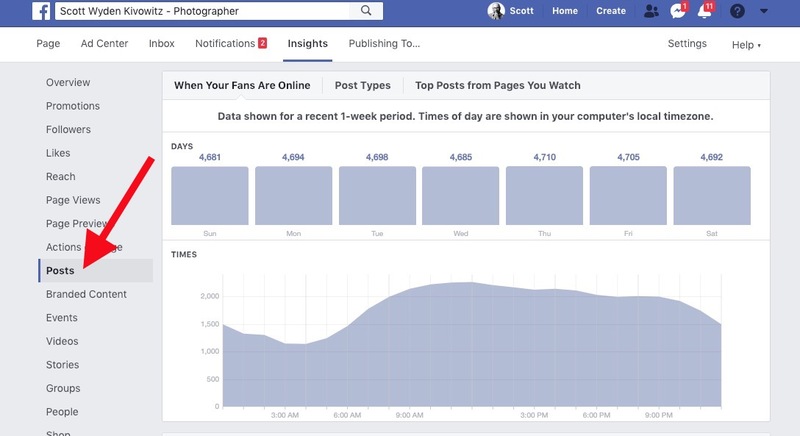 Now it’s your turn to figure out your best time to post on Facebook. Your Facebook page is not attracting your target market. Your idea of when your target market might be online could be wrong. If either of those two things is true, it might be time to step back and evaluate your Facebook marketing efforts. Good luck and here’s to better reach through Facebook!